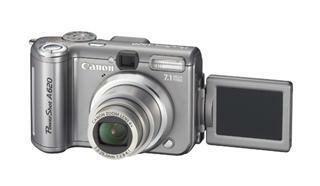 Digital Camera Info (link dead): The A620 has big shoes to fill; the 4 megapixel A520 was Canon’s top seller of 2005. It provided bread-and-butter basics and manual functionality at a really good price. The Canon A620 adds a few more megapixels and a few more features; it comes with 7.1 megapixels and a 4x zoom lens, along with the My Colors picture effects mode and a slightly larger 2-inch LCD screen, which flips out from the camera body and rotates to just about any angle. This is great for viewing with a group of friends, but isn’t great for recording because of the constant adjustments that are needed with the glare the screen catches. The LCD is still a better viewing option than the optical viewfinder, which is blurry and inexcusably inaccurate. Also, the Canon PowerShot A620 is quite hefty, thanks to its four AA batteries. Despite all this, the Canon PowerShot A620 is still a good deal. It offers automatic, scene, and priority modes for beginners. It also has a manual mode where users can adjust the shutter speeds and apertures for themselves. There are live views to facilitate the transition from automatic to manual. And the camera’s heavy four battery setup gives it fantastic battery life, with 350 shots per batch. The Canon A620 retailed for $399 when it was first introduced to the market, but can be found for a hundred bucks less now – making it one of the best deals for users after a pocket camera with manual functions.